Like the more well-known west-side canyons (such as Maidenwater, Trail and Swett), the east-side tributaries of Trachyte Creek are also narrow and enclosed, and a few form good slots. Access is more difficult, however, as the high cliffs surrounding North Wash prevent any approach from the east; instead the canyons may be reached either from the north, by a 4WD track across the Trachyte Point plateau, or from the west by walking down one of the Trachyte tributaries that cross UT 276, then fording the creek. 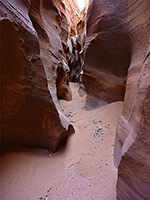 The best of the eastern slot canyons seems to be a drainage about halfway between the UT 276 crossing and Lake Powell, cutting into the south edge of Trachyte Point. 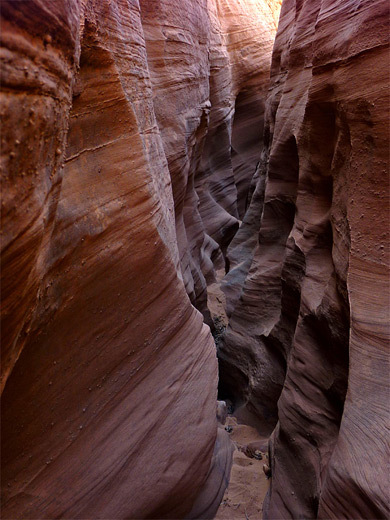 It has no official name but is known in canyoneering circles as Witches Cauldron on account of a particularly deep pothole, or Trachyotomy because some parts are very narrow. Over half the slot is accessible to hikers, before a 35 foot dryfall that leads to the technical lower section, which ends at an enclosed chamber also reachable by walking up from below, after following an easy bypass route. The upper slot is deep, colorful, twisting and contains no major obstacles, requiring only some stemming in a few places which are too narrow to follow at floor level. Topographic map of Trachyte Point Canyon. 23 views of Trachyte Point Canyon. The shortest hiking route to the canyon begins 4 miles along the narrow track which leaves the east side of UT 276 between mileposts 3 and 4, north of the Trachyte Creek crossing. It starts off due east then bends southwards, coming quite close to the rim of Hog Canyon, a North Wash tributary. The track ends at a drill hole site 3/4 mile northwest of the upper end of the target canyon; the main slot starts 1.4 miles south. High clearance, 2WD vehicles can make the trip in good conditions though people with regular cars may have to use the longer approach, starting at the parking area for Maidenwater Springs, on the west side of UT 276, from where the upper end of the slot is between 4 and 5 miles away cross-country, depending on the route; one option is to walk northeast up a gentle sandy slope (part of Maidenwater Sands) then descend into a deepening drainage, which is followed downstream to the junction with Trachyte Creek - right opposite another tributary (North Trachyte Point Canyon) that also contains a slot. The larger Trachyte Point Canyon joins from the east, 0.6 miles south. The upper reaches of the canyon are deep but mostly open (apart from one short slot section), bordered by big slickrock slopes and benches, steepest on the northwest side. 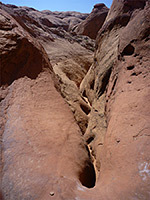 The sandy streambed leads to the first major slot after 1.3 miles, starting quite abruptly with a small drop into a circular bowl then a twisting chute to a lower passage, which is soon partly blocked by two boulders, passable either by climbing over the top or squeezing down beneath, into the main part of the narrows. Initially the canyon is just wide enough to walk along at floor level, and it depends steadily, the cliffs at either side rising high above, but as is usually the case with Trachyte Creek slots, they do not overhang, so the narrows are never particularly dark or enclosed. 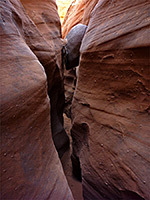 After a while, one bend is too tight to continue at floor level and it is necessary either to climb up - a maneuver not easy at this point, or alternatively return to the start of the narrows, walk along the rim on the northwest side and return to the streambed little way further, at which point the drainage is wider and V-shaped. More of the upper slot can then be seen by walking upstream. Downstream of the re-entry point, the canyon is soon blocked by a 35 foot dryfall, below which the passages are still open for a while, before entering a darker, more convoluted slot containing several deep potholes, which ends with a 30 foot drop into an enclosed chamber. This technical section extends about 1,000 feet. For hikers, the chamber may be reached via another entrance/exit route not far below; descending into a slickrock bowl and following a little sloping ridge to the streamway, where several large, shady cottonwood trees grow. 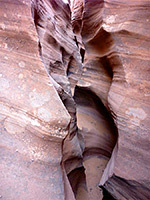 Upstream, the vegetation soon stops, and cliffs on the southeast side form a high, arching alcove streaked with desert varnish, above a narrow place and a small pool; the circular chamber at the lower end of the slot lies just beyond, with another deep pothole immediately below the drop. Downstream from the cottonwood trees, the remainder of the canyon is moderately overgrown, not narrow, and has residual pools and short sections of flowing water, all much frequented by cattle.